The Mark Taper Forum presented the opening night of the Public Theater and Berkeley Repertory Theatre’s production of “Head of Passes”, headlining award-winning actress, Phylicia Rashad, with a cast of adroit supporting actors. Written by Tarell Alvin McCraney and directed by Tina Landau, the show’s program denotes the setting as, “a house that sets near to the Head of Passes, where the Mississippi River meets the Gulf of Mexico.” Rashad portrays Shelah, the matriarch, strength and backbone of a Black family connected by love and dysfunction. Yes, there is love here but underneath it all, the hidden family secrets become fecund, bursting at the seems. 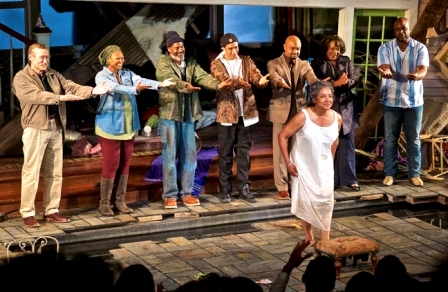 The supporting cast; Alana Arenas (Cookie), John Earl Jelks (Creaker), Kyle Beltran (Crier), Francois Battiste (Aubrey), Jacqueline Williams (Mae), and J. Bernard Calloway (Spencer), run about in a flooded living room in the midst of a storm, establishing a family dynamic that is believable, likeable; they care about Miss Shelah and the comedic jousting that diverts us from some of her painful moments of despair. She is hiding devastating news from the family and Dr. Anderson (James Carpenter) pleads with her to use this time wisely, by telling the truth about her failing health. Sheila’s friend, Mae is that friend who has known the kids since birth. Somehow, even through Shelah’s struggles, we believe it will work out. But McCraney slips in those scenarios that take this family one step forward but three steps back, with leaking roofs, flooded rooms, bickering kinfolk and a pregnant Cookie, who reminds Shelah of the childhood dark secrets of abuse that she turned a blind eye to when her husband was alive. Shelah wants to make right by offering Cookie part of the house. But cookie wants nothing to do with a house that reminds her of such betrayal and helplessness. She just wants the dope money and we understand why, now. But Aubrey doesn’t understand because we don’t always know people’s truth; that abuse breaks the spirit of the young and their youth is never replaced. Rashad forces you to check yourself and your own mortality; she sacrifices physically to bring to life the real moments of a dying mother whose life is falling apart before our eyes. She goes to unsafe places physically to make this character vulnerable, angry, submissive, humbled, and believable. Rashad is still our mother, just older and still teaching and preparing us for life (and death) in “Head of Passes”. McCraney has written a tragedy that forces us to listen to a battered woman who needs answers, and so do we. He spoke to the writer Julie McCormick, in her article, “Shining a Light on Tarell Alvin McCraney”. “The idea of opening up the dialogue about a person’s personal faith was and is always the main focus of the piece,“ he said.